Let me guess, you’re writing a marketing proposal right now? Marketing plans alone can be brutal — much less pitching them to potential clients or top company brass. Often, they take tons of time, brain power, and busy work. And the worst is when the salt of losing the project gets rubbed in. If you’re writing a marketing proposal right now, you’re in luck. This post is the fastest way to craft your strategy, communicate it, and then get to yes on your project. 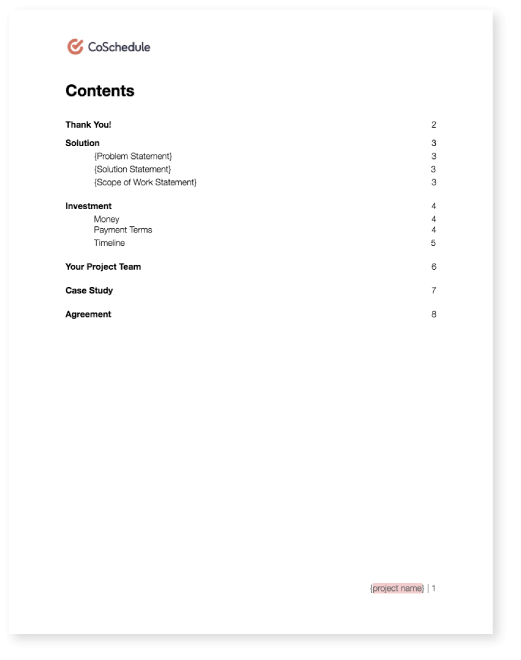 You get an awesome marketing proposal template. It’s flexible, so it works for both internal and client-facing work. And also, a detailed guide on how to approach each section. Proposals are tricky and pesky things like formatting take precious time. This template gets that — and more — out of the way. …and I wish I’d had this template to speed the process along. Who Is Your Marketing Proposal For? Your marketing proposal will vary based on what you need it for. A proposal for internal company stakeholders may look different than one for landing a new client. Either way, as with all amazing content, it begins and ends with your specific audience in mind. This means it will hyper-focus on your client's or stakeholder's needs. After all, the project is about accomplishing their goals. This means a winning proposal shouldn't be a press release for your expertise. This template is flexible and will work for both people pitching internal stakeholders as well as those working with clients. 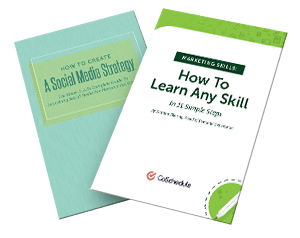 So, whether you're an in-house marketer or a marketing agency, this template will work for you. 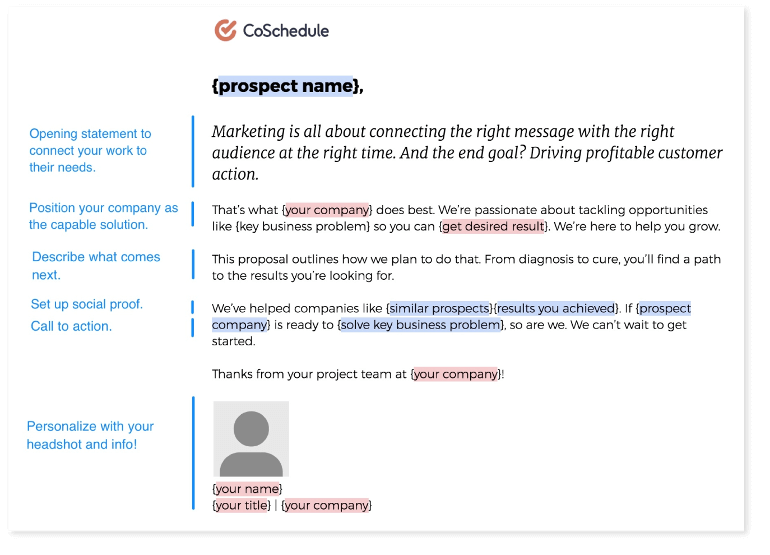 First, if you're using this marketing proposal template to pitch a project to internal stakeholders, remember they're fielding as many last-minute fire drills as you are. They are pressed for time. And everyone wants their attention. Executives like Warren Buffett read as much as 500 pages per day. So make your proposal count. Keep it focused, brief, and valuable. Second, if you're using this template to land new clients, they're just as busy — and magnetically drawn to the dollars and cents. That's why it's key that your proposal agitates the pain of the problem, then highlights the solution throughout. Keep it succinct. Marketing proposals aren't the most riveting reads. Efficiently deliver the key insights, strategy, and information. Focus on return on investment (ROI). Every project should add more value than it costs. Make sure your project's positive value outshines its cost. Frame costs accurately. Obviously, you have to outline the hard costs associated with your project. Stakeholders need to know what new tools and external vendors need to get paid for. However, it can be easy to skim over intangible costs like employee time and other expenses. Include all applicable effort within scope. First, the front matter section includes a cover, table of contents, and opening statement. Your cover page has placeholders for everything. 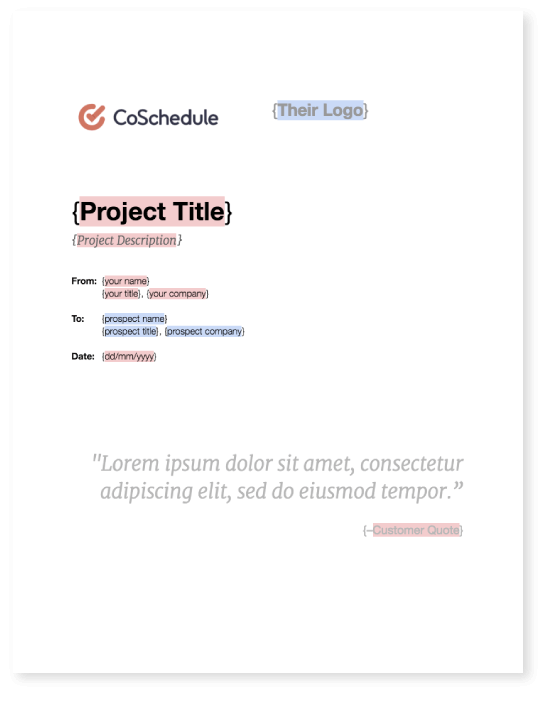 The text highlighted in red means it comes from your company or project information. And the blue highlights mean it's from your client's or stakeholder's info. At the bottom of this page, you'll find a suggested place for one of the most powerful pieces of content: the customer testimonial. In fact, per Nielsen research, 92% of people trust recommendations from people they know, and 70% even from those they don't! Include a customer testimonial from a person or brand the prospect is familiar with. Or use the most trust-building customer statement related to your project. Next is the tried-and-true contents page. 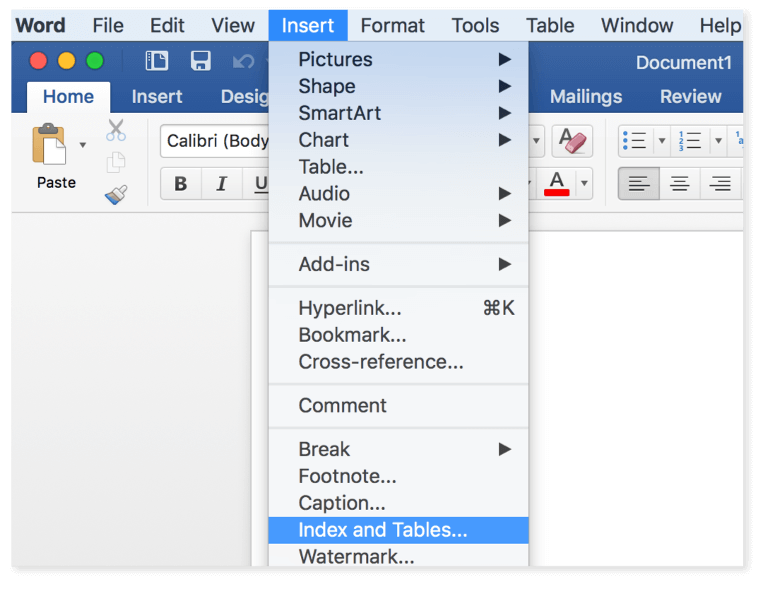 If you're using this template in Microsoft Word, you can easily insert a table of contents by selecting Insert from the top menu. 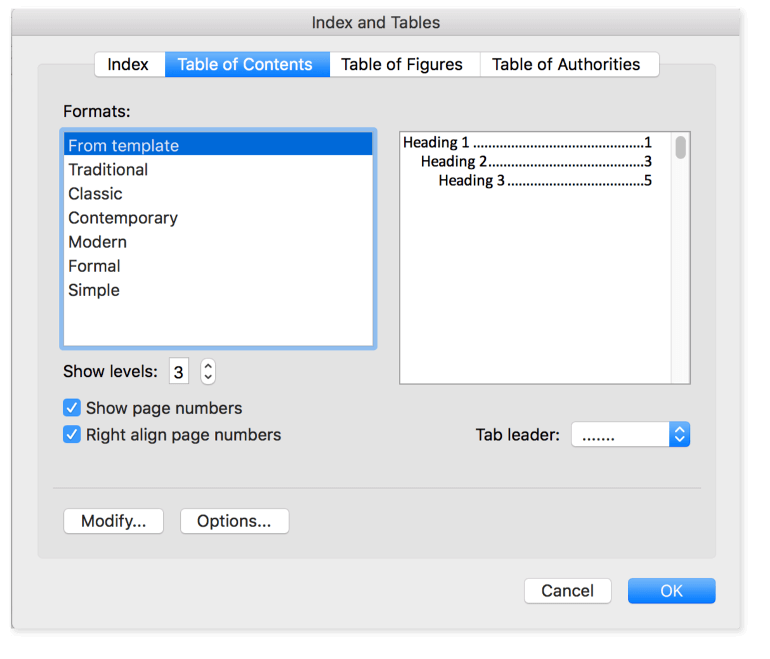 Then, select Index and Tables. From there, choose Table of Contents, then style accordingly. This will automatically grab the headers from each section. The first section of content after the front matter is your opening statement. This is often called an "Executive Summary." But I hate that. 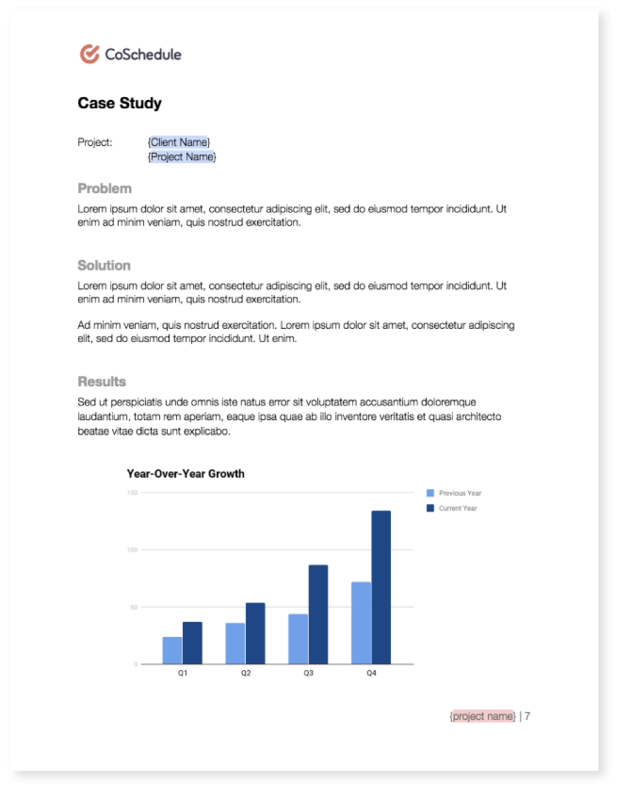 The executive summary is arguably the most valuable component of any proposal, but most people are confused about its purpose. It’s actually not about summarizing at all; it’s about selling. So, let's ditch the jargon-filled summary and get to doing what marketers do best: connecting, persuading, and selling. An opening statement to connect your work with their needs. A positioning statement to showcase your company as the ideal solution. A brief preview of what's inside. A statement to set up further social proof (and your case studies). You can massage the template language however you'd like. Just keep in mind the Opening Statement's purpose: to connect your prospect's pain with your ability to solve it. Next up, we have the heavy lifting. Problem Statement: This is your diagnosis of the business problem you will solve. Solution Statement: This is your plan to solve this problem and a preview of what the results will look like. Scope of Work Statement: This is how your project will get done and the bounds within which your effort (and theirs) will stay. This section has the potential to get pretty involved — and long. But in most instances, it should fall somewhere between a napkin sketch and a lean canvas. A napkin sketch is an ultra-simplified version of a model, idea, or strategy. 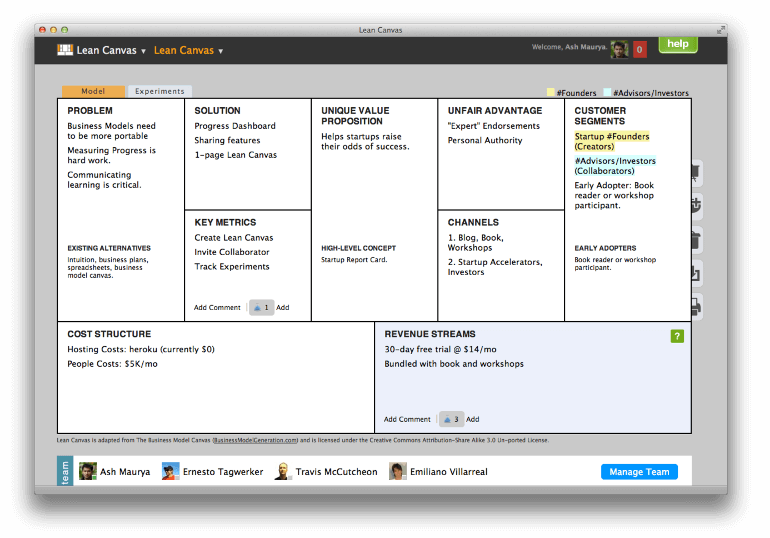 And a lean canvas is one-page business plan that includes the key points of how the key elements will get done. The investment section is what *almost* everyone wants to look at first. We want this answer: "How much will it cost me?" Money: This is the estimated dollars-and-cents cost. Time: This is the total project timeline, and includes the major deliverables from both sides. 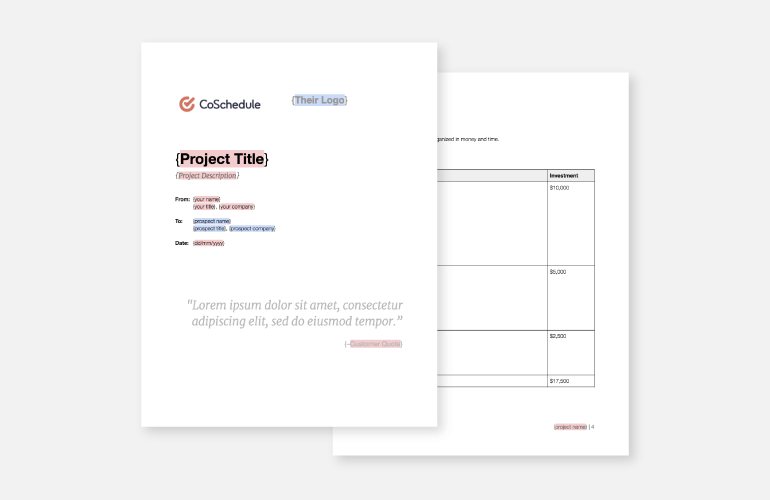 In the marketing proposal template, you'll find a grid format for outlining costs. You certainly don't have to present the figures this way. But if your cost structure is relatively simple, it's an way to do it. The Service line placeholders are individual line items. This could be hard costs for anything from software to hardware to consulting services. Any sub-items that contribute to that cost (e.g. a software tool with a set-up fee included). Finally, notice the sub-heading for Payment Terms. While these will likely be listed in your product or service agreement section at the end, it's helpful to include them here, as well. Do you require 50% cash up front, then the final 50% upon completion? Will the payments be in equal monthly installments? Are you billing for regular retainer services? Is there a commission or affiliate payment structure? 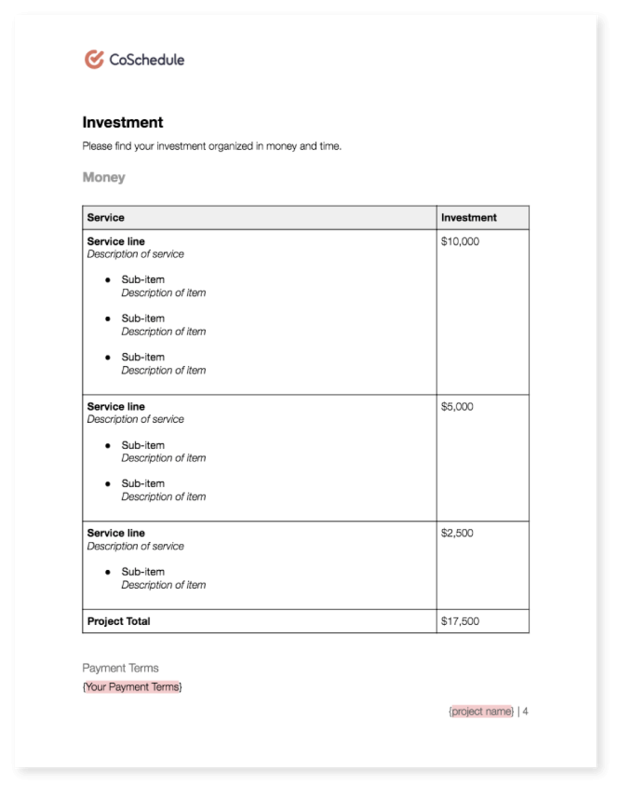 Are invoices due net 15 or net 30? After the monetary investment comes the timeline. 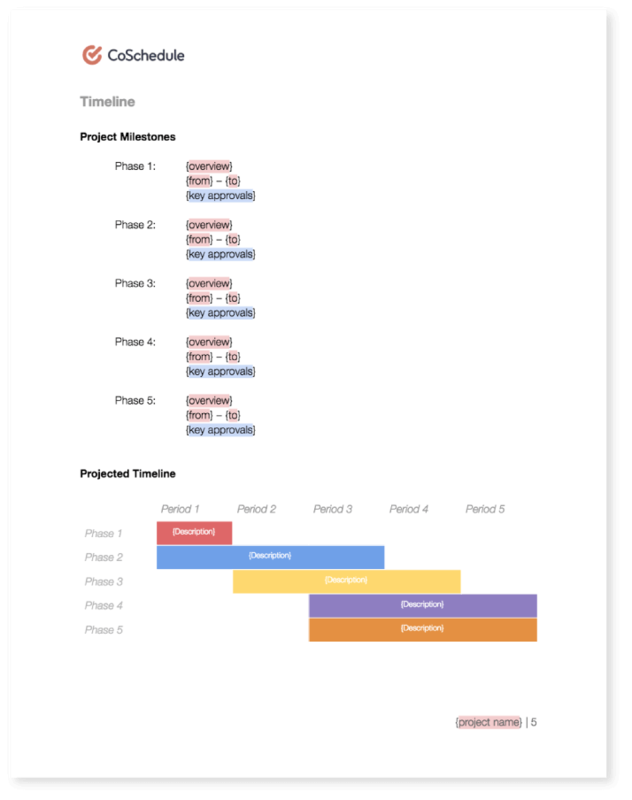 Your project timeline will vary based on your process and deliverable schedule. But the Project Milestones and Projected Timelines make it simple to give a 10,000 foot overview of the entire project. ...especially if there is a committee involved. By adding in key approval milestones, you set the tone for timely decisions and show what's at stake if decisions are delayed. After all, no one wants a project grinding to a halt, right? Well, if approvals are slow, progress will be as well. Next, accompanying the milestones is a corresponding visual timeline. It pretty much acts as a Gantt chart. While it's not strictly necessary, it is a nice way to show the overlap of phases. This is extremely helpful workload planning and project coordination. Now it's time to introduce the project team. ✅ Do: include a professional headshot for each person. ✅ Do: include their name and title. ✅ Do: include a snappy bio of about 50 words or less. 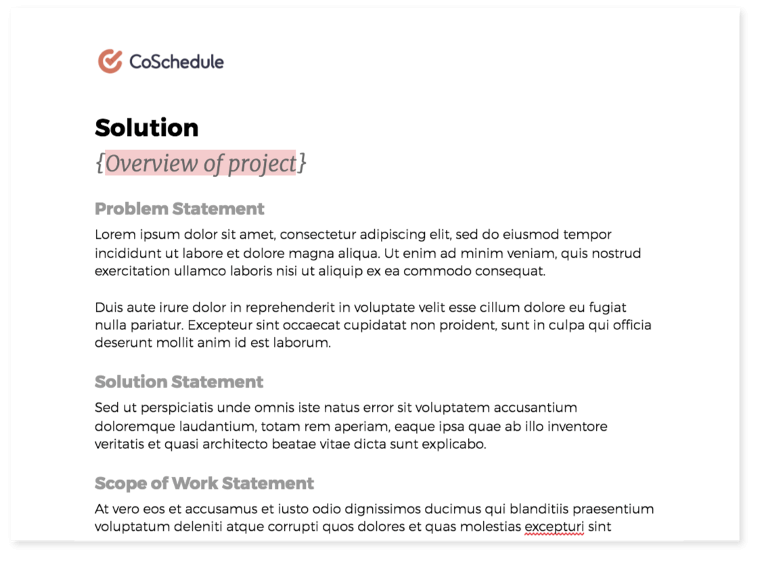 ✅ Do: include the background most relevant to the project. 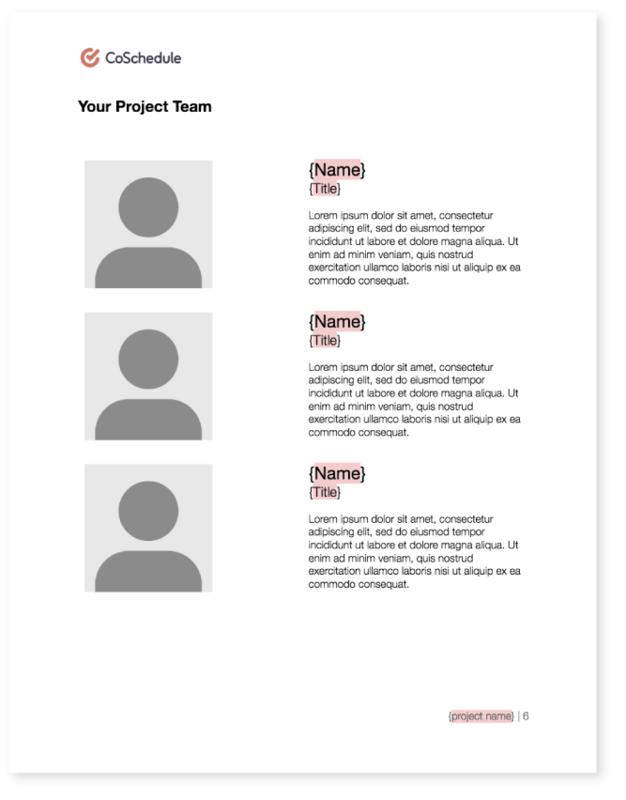 ✅ Do: include only those people working on the project. ❌ Don't: include everyone in your company or department. Next comes the case study. This section is all about providing proof and credibility that you can knock the project out of the park. An analysis of a project, campaign or company that identifies a situation, recommended solutions, implementation actions and identification of those factors that contributed to failure or success. It's best to keep this section tightly focused. Add only related projects. For example, if you're proposing a social media marketing campaign, a website project case study isn't super helpful. Outline the problem. What business or organizational problem were you trying to solve? Describe the problem, its nature, and its impact. Show your solution. How did your team solve the problem? Show the concrete steps and deliverables along the way. Graphics, mockups, and images that showcase your team's process are fantastic here. Present the results. Did your project move the needle? Present the tangible results your solution accomplished. Data presented in a period-over-period format is extremely beneficial here. Essentially, you're showing a before/after picture to highlight what your project accomplished. Need A Framework For More Complex Projects? Now, this format may be overly simplistic for ultra-complex projects. Here is a slide share that outlines two types of case studies: factual and fictional. They help you provide intense detail, real outcomes, and more deeply describe your methodologies. Now, check out these case studies below for some inspiration. 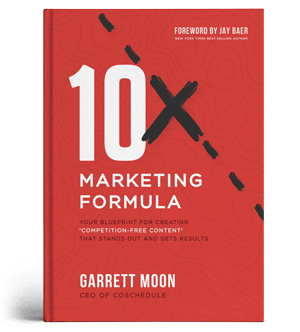 You'll find they follow the three step — problem, solution, results — framework waiting for you in the marketing proposal template. Welcome to the nuts-and-bolts of the business world. This section is where your contract terms, fine print, and signatures live. And is most pertinent to those offering client products or services. I did think about law school for 34 seconds at one point, but I did not execute, and therefore, am not a lawyer. In lieu of legal counsel and contract advice, however, I can offer you some best practices and point to a couple of resources you may find helpful. Use this section as a form of clear communication. It outlines the expectations on both parties. How your agency, consultancy, or company will execute your deliverables. Helpful definitions to avoid misunderstandings in legal or technical terms. How data or other valuable information is kept confidential. What happens if the project exceeds the agreed upon scope of work. When payments are due and what taxes are included. Who owns the work or intellectual property produced. The code of conduct both parties agree to comply with. The extent and limits of liabilities associated with the project. Miscellanea specific to your work or project. And of course, who can forget the ink! This is the fun part, where both parties sign on the line. This may seem self-explanatory, but it's critical that your contracts move beyond a verbal agreement. While hearing something like... "Sure, this looks great. Let's move ahead..." from a client is awesome, it isn't reality until the agreement is signed. However, you can also use an e-signing service like DocuSign, Adobe Sign, or HelloSign for legally binding digital signatures. 📈 and focus on actually getting results rather than writing proposals! Now, if you're working on proposals — or any other projects — with anyone else, chances are you need one place to get everything organized. I'm talking total visibility and seamless collaboration... One source of truth for every task, approval, and campaign. ...sign up for your 14-day FREE trial. Now, go get that yes! And if you have questions or comments, make sure to leave a message below. We love to talk shop.